There are a lot of characters in George R.R. Martin's A Song of Ice and Fire. There are twenty-two characters named Jon alone, and thousands more not named Jon, and it would be a tall order to expect any TV show to cram every single character into their adaptation of the series while still being watchable. So I think we can forgive the good people at HBO for cutting a major player here and there in Game of Thrones (except for Lady Stoneheart, you monsters). But that doesn't mean we can't still stare wistfully at the books, wishing we could see our favorite characters onscreen. Here are a few of the great book characters who were cut from the Game of Thrones TV show, because Westeros is even more complicated than you thought. To be clear, this list barely scratches the surface of the mind-bogglingly huge cast of characters we meet in A Song of Ice and Fire. And there are plenty of characters who have minor, background roles on the TV show, but who have way more to do in the novels. Wyman Manderly, for example, was lumped in with a bunch of hairy Northman screaming about Jon Snow in the finale of season six. In the books (SPOILER), he gets his own secret plot, culminating in him (not Arya) baking some Freys into a pie. Lady Freaking Stoneheart, man. There should be a sick music drop every time she rolls up in the books. In both the show and the books, Catelyn Stark is killed at the Red Wedding and tossed into the river. In the books, though, Arya's wolf Nymeria pulls her corpse out of the water, and local friendly zombie Beric Dondarrion gives his own life in resurrecting her. Now Catelyn is back as Lady Stoneheart, a revenge-fueled zombie mom who's leading the Brotherhood and murdering anyone even remotely connected to the Red Wedding. When we saw her last, she was about to execute Brienne and sweet innocent Pod for conspiring with the Lannisters. In the books, Arianne Martell is the next in line to rule Dorne. She believes that her father, Prince Doran, is going to pass Dorne to her little brother, Quentyn, though, so she tries to seize power by crowning Lil' Princess Myrcella. Dornish law allows girls to inherit the crown, but Arianne's plan backfires, and Lil' Myrcella loses an ear. The TV show decided to cut this scheming princess plot-line in favor of a Dornish road-trip for Jaime and Bronn instead. The other major Martell sibling who didn't make the TV show is Quentyn. In the Quentyn chapters, we discover a whole secret Martell-Targaryen plot, which requires awkward little Quentyn to head all the way over the Meereen to try to win the hand of Daenerys Targaryen. Unfortunately, he shows up right after she's gotten married to a Meereenese nobleman. Quentyn decides to try and impress Dany by taming one of her dragons anyway, which ends with dragons on the loose and Quentyn being fried to a crisp. We don't know much about Oberyn's daughter Sarella Sand, but she's so freaking cool and why isn't she in the TV show? She's not in Dorne when all of the Sand Snake drama is going down, and she's described as being a big fan of Oldtown. Then, at the Citadel in Oldtown, we meet a mysterious young Maester-in-training: a boy known as Alleras or "the Sphinx," who looks a lot like Oberyn Martell. So...Alleras is "Sarella" backwards, and Sallera is clearly at the Citadel in drag as a secret lady grad student. More of that, please?? This one is a huge game changer, so we can kind of forgive HBO for not wanting to throw another Targaryen in the mix. But in the books, Tyrion ends up traveling with this mysterious, blue-haired kid called "Young Griff." Once he washes his hair dye out, Young Griff turns out to be the long lost Prince Aegon, son of Rhaegar, who was supposedly killed as an infant. Or is this cool teen Aegon actually a fake being passed off as a true Targaryen? We don't know yet, but he's already conquered one castle in Westeros, and he's gunning for the Iron Throne. Aegon's fake dad, Griff, turns out to be exiled knight Jon Connington. The show sort of mashed him together with Jorah Mormont, but in the books it's Connington who's slowly dying from greyscale, and who's stressing about getting his baby Targaryen on the throne before he kicks the bucket. Poor Jeyne Poole. She suffers so much, and her character gets cut from the TV show after having no lines in season one. 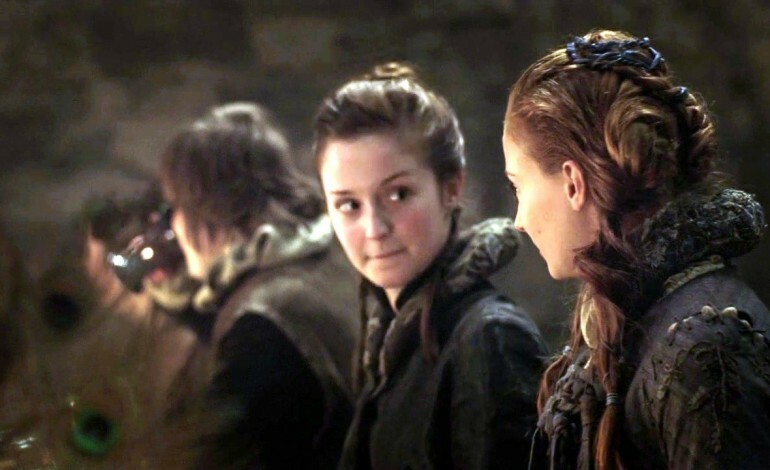 Jeyne's father was the steward of Winterfell, and Jeyne was Sansa's BFF. After the downfall of the Starks, the Lannisters nab Jeyne, stuff her in some wolf-themed clothing, and pass her off as Arya Stark. As "Arya," Jeyne is forcibly married to Ramsay Bolton, who abuses and tortures her until gross Theon Greyjoy helps her escape. Her plot-line was handed off to Sansa on the show. Patchface is the single creepiest character in A Song of Ice and Fire, and that's saying something. He's Stannis Baratheon's fool, but he nearly drowned in his youth, permanently damaging his brain. Now he's a grown man with motley tattooed on his face, following little Shireen around and muttering strange, nonsense songs that usually turn out to be true predictions of violent events. Even the Red Woman is scared of him. A lot of Dany's posse ended up cut from the TV show. Strong Belwas is a notable absence, though: he's funny, fierce, and incredibly strong. A former champion of the slave fighting pits, it's Belwas who defeats the champion of Meereen when Dany takes the city, and it's Belwas who eats the poisoned snacks that Dany's Meereenese husband meant for her. Val is a wildling princess. Well...kind of. She's the sister-in-law of Mance Rayder, and taking care of his baby (or rather, Gilly's baby—there's a lot of complex baby-switching). Val's sister died in childbirth, and Mance is currently "dead" but secretly disguised as another wildling (don't worry about it), so Val is the only "royal" the Freefolk have left. Plus, she's a tough wildling woman who knows the forest better than any Night's Watchmen. In the show, Robb gets a cool, spunky nurse wife from Volantis, who is horrifically stabbed to death while pregnant at the Red Wedding. The book is (you guessed it) more complicated. Robb marries Jeyne, a Westerling, whose family is allied with the Lannisters. The Westerling family pretends to be cool with it and switch teams, but then they help bring Robb down during the Red Wedding (which Jeyne is forbidden to attend). There are a lot of Greyjoys, so... honestly, I'm fine with the fact that Victarion didn't make the TV show. In the books, though, he's a scary Greyjoy uncle who's working for his hated brother Euron, and he's yet another suitor gunning for Dany's hand in marriage. He's also dumb and terrifying, and he beat his last wife to death. So he's not a super fun protagonist, but he makes a solid villain. Remember when everyone was killing dwarves and delivering their heads to Cersei, hoping she'd think one of them was Tyrion? Penny's brother was one of those heads. Penny winds up on the same ship as Tyrion, with her dog, Crunch and her pig, Pretty Pig. At first she hates Tyrion for her brother's death, but then she totally falls for Tyrion, who actually rejects a woman's advances for once. Their relationship is complicated, and Tyrion ends up trying to protect Penny as they faced down the siege of Meereen.